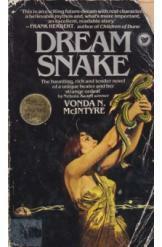 Dream Snake Vonda N McIntyre Sci Fi. Book is in good condition, all pages intact. A mystical healer, Snake takes her name from the alien dreamsnake from whose venom she distills her potent medicines and cures. With her dreamsnake killed by an ignorant populace, she must now seek a new one, pursued all the while by a desperate lover and a desperate patient.